MARVELLOUS LAMP CLEAR - Durance modernises an ancestral catalytic lamp process with its marvellous lamp for providing long-term fragrance and cleansing the inside of your home. This pure translucent glass catalytic lamp presenting an incomparable luminosity. It will be in harmony with the inside of your home regardless of the type of decor you have. Adorned with its prestigious crown with fine floral motifs, the Marvellous Lamp will be able to adapt to all styles. Contains a glass lamp that is sold empty, a plastic funnel, a burner with wick, a crown and a snuffer cap. 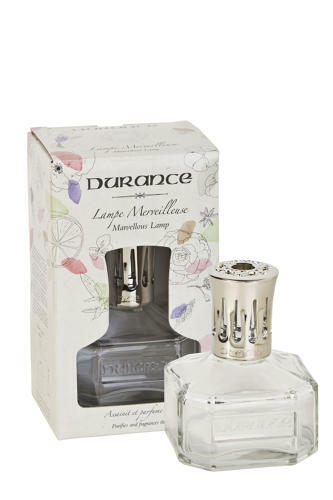 To be used with Durance Marvellous Lamp fragrances.